Of course, in retrospect we have learned that the first stimulus was mostly about saving government jobs as well, rather than creating any private stimulus. Government workers are among the Democrats most reliable political supporters, and the SEIU, among other organizations, have had close ties to Obama for years. State and local governments are finally facing some accountability for spending and being forced to roll back spending increases of the last few years that have far outpaced inflation and population growth, so of course Obama wants to short-circuit this accountability process. Think about this -- every one of these bailed out governments have certainly had local legislative deliberations and likely votes on bonds and tax increases over the last year. If their problems still persist, its because the local taxpayers don't want to pony up any more money for their local government and the local legislators refuse to cut spending sufficiently. So if Smallsville, California won't pony up more money for their government and won't balance their budget, why should I be on the financial hook to bail them out? I have been looking for a good excuse to clear my reader cache of a whole series of articles on government salaries and pensions, and this seems a really good time. "Who are America's fastest-growing class of millionaires? They are police officers, firefighters, teachers and federal bureaucrats who, unless things change drastically, will be paid something near their full salaries every year--until death--after retiring in their mid-50s. That is equivalent to a retirement sum worth millions of dollars. Chris Edwards has a related essay, focusing on federal government pay. Matt Welch looks at two DC-area counties and shows how their relative financial health is closely related to their hiring and pay policies. Readers of the site know that I do not generally join in with the Conservative bashing of unions, except to the extent that they feed at the public trough (e.g. at GM) where I will bash them equally with all other similar hogs. Unions are perfectly acceptable associations of individuals in a free society for a generally rational purpose. 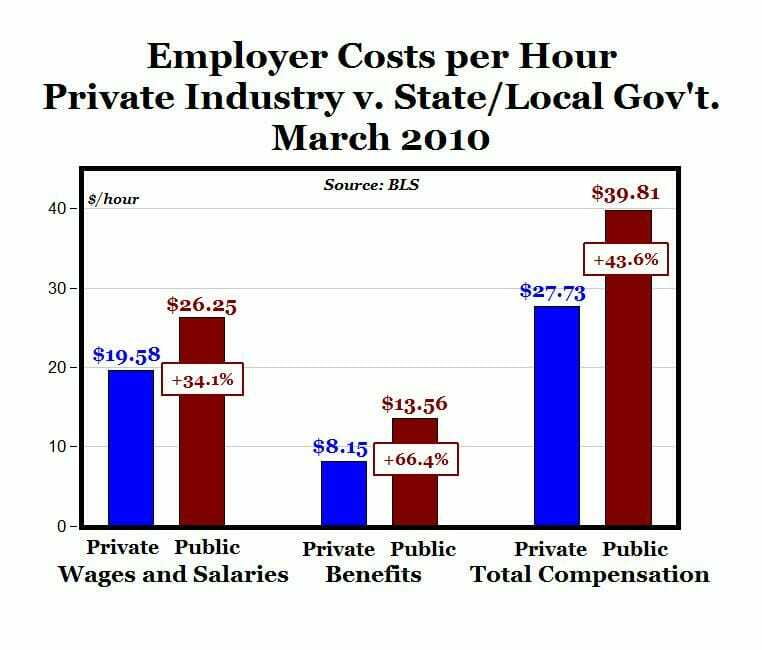 What upsets this equation is when the government attempts to intervene to tilt the playing field either towards employers or unions in their negotiations -- but this is a government intervention issue, not a union issue per se. 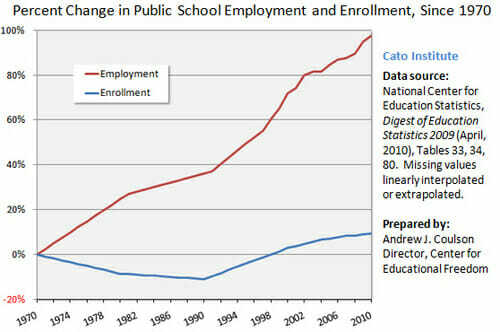 Far more problematic is the growing influence of public employee unions. 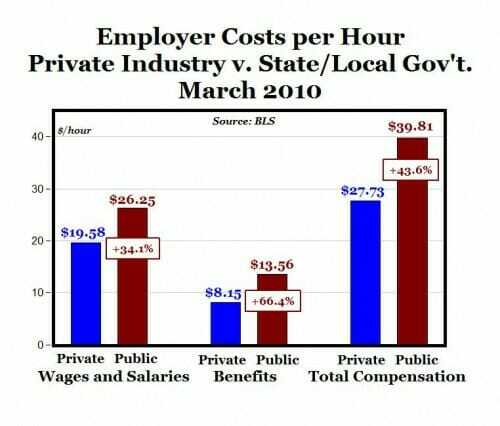 Union advocates talk about the need to help private unions in a power imbalance with large corporations, but talk about a power imbalance! In the public sector, we have hugely powerful unions with absolutely no one willing to take them on. Government leaders who supposedly should be advocates of taxpayers and pushing back against union demands are typically in bed with unions. One might say it is a similar case to unions owning the private company in which they work, but in that case there are market dynamics that mitigate against overly high pay or indifferent customer service. No such balancing mechanisms exist in government monopoly institutions. There have been a lot of articles on this topic of late that I have been keeping in my reader but have not linked, so to do a bit of tab-clearing, here are some good recent articles on public sector unions. Carpe Diem shows the direct relationship between increasing public sector unionization and public sector debt. Chris Edwards appears to be the original source. Chris Edwards followed up to show an inverse relationship between state management quality and unionization. Bruce McQuain discusses the $500 billion California unfunded pension liability. And this does not include the unfunded liabilities of all the state's cities and towns and counties, which typically don't book any liability at all for their future pension and medical commitments. Steven Malanga on how public sector unions broke California. Traditionally, public sector unions have exercised a lot of power in elections, as evidenced by this example of the success of unions in fielding winning candidates in California school board elections. Bruce McQuain reports that the SEIU has even formed its own 3rd party in North Carolina. Its amazing that candidates whose main platform is to shift more taxpayer resources to the pockets of government workers has success. USPS workers participate in the federal workers' compensation program, which generally provides larger benefits than the private sector. And instead of retiring when eligible, USPS workers can stay on the "more generous" workers' compensation rolls. Collective bargaining agreements limit the amount of part-time and contract workers the USPS can use to fit its workload needs, and they limit managers from assigning work to employees outside of their crafts. The latter explains why you get stuck waiting in line at the post office while other postal employees seemingly oblivious to customers' needs go about doing less important tasks. Most postal employees are protected by "no-layoff" provisions, and the USPS must let go lower-cost part-time and temporary employees before it can lay off a full-time worker not covered by a no-layoff provision. The USPS covers a higher proportion of employee premiums for health care and life insurance than most other federal agencies, which is impressive because it's hard to be more generous than federal agencies. If the collective bargaining process reaches binding arbitration, there is no statutory requirement for the USPS's financial condition to be considered. This is like making the decision whether or not to go fishing, but not taking into consideration the fact that the boat has holes in its bottom.